If I could, I'd submit this post as series of drawings using my favorite app, Paper from FiftyThree. Not only do I love to draw, I also love the low-cost, easy-access creative tools available to allow seamless blending of visual and verbal storytelling. The tools of our trade have changed dramatically in the past few years — videography no longer requires years of experience and thousands of dollars of equipment. Photographic images can be manipulated with the touch of a button, and touchscreen PCs and mobile devices are indulging my long-held desire to fuse written and verbal storytelling with huge tracts of (virtual) butcher paper and markers. With these creative resources at my fingertips, I'm ready to submit for consideration Moede's Law, to give Intel co-founder Gordon Moore's law a run for its money. Moore's law states that the number of transistors on a chip will double approximately every two years. This simple, but insanely accurate, law has led to constant technological advancement, changing the way we live, work, play, and practice public relations. But what about creativity? Are the technology-meets-art tools available to public relations professionals doubling the creative output of our industry every two years? My law may be a bit more difficult to measure. Creative firepower is complicated by the land-grab and commoditization that takes place whenever a new communications archetype is introduced into the public relations consciousness. Remember the hullaballoo about multimedia press releases? The hallowed infographic is in danger of becoming today's multimedia press release, despite the fact that early infographics were a revelation combining high-impact visuals with the facts and features that form the core of every great story. Trust me: I'm not giving up on the infographic, but it does take double the creativity to create a visual communications vehicle that won't degrade in impact as it increases in uptake. Looks like I'm going to have to invent another law about the half-life of new creative executions. Dan Roam's excellent “Back of the Napkin” series shows that creative tools (in this case simple stick-and-line drawings) are the medium for a good story, not the story itself, like a tube of oil paint is the medium for an artist. But access to paint doesn't make you a painter; an easy-to-use medium will never eliminate the need for great content and execution. Whatever the next great visual medium – I'm putting my money on the stack of hand-drawn PowerPoint presentations I have back at my desk – this new visual landscape should translate into more powerful and creative storytelling across any and all channels. Two years, double the creativity. 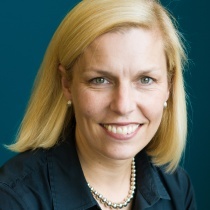 Jenny Moede is Waggener Edstrom Worldwide's president for the North American region.